Conveys steering racks from the workrest of a centerless grinder to the workrest of another centerless grinder. Racks exit the first grinder and be conveyed into a transfer device. The transfer discharges the parts uphill and onto a rolling ramp. The parts exit the ramp onto an infeed ramp attached to an entrance conveyor. 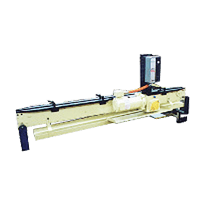 The conveyor conveys the parts into a pinch wheel device that aids the parts into the grinder. Conveys track pins between workrests of two Cincinnati centerless grinders. Accepts strut shafts from the workrest of a Cincinnati model 350-20 RK centerless grinder and conveys them to the workrest of a Cincinnati Model 350-20 RK centerless grinder.